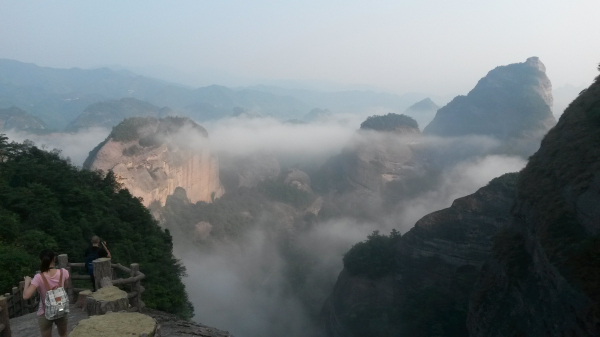 In late September, our General Manager Wei Wu have made his journey to Danxia National Geological Park of Ziyuan County in northeast part of Guilin. One gets used to the scenery he or she grows up with and take it for granted. I grew up in south Guilin and frequented the hills nearby, climbing the cliffs, chasing the mountain goats and fetching water from the local well for my gold fish, all without knowing that this city would become one of the most scenic travel destinations in China. For the people in Ziyuan, I guess the same applies. 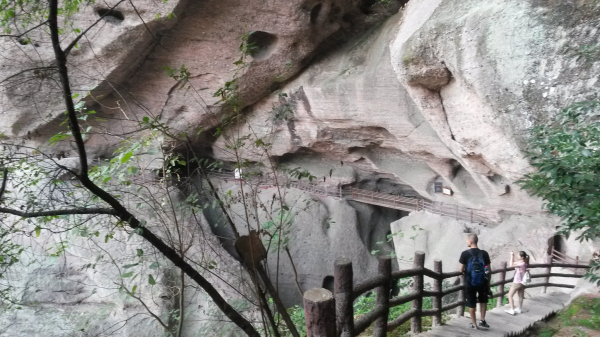 Ziyuan is an outlying mountainous town around 170km north to Guilin. 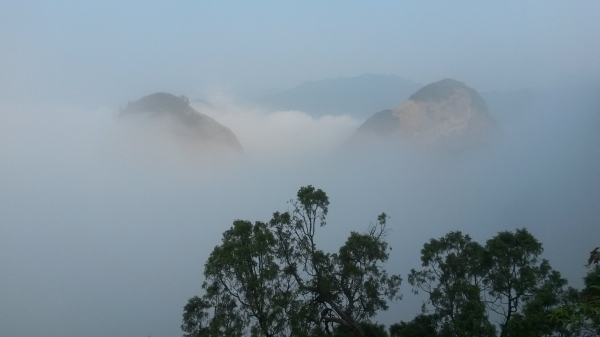 I went there recently and climbed the Danxia hills early in the morning. The word Danxia does not have English translation as the land form is not found elsewhere in the world. Dan means “red”, and Xia, the “red cloud at sunrise or sunset”. The rocks are of light red color sandstone of the Cretaceous age with lots of layers of pebbles embedded. We set out at 07:15 in the morning and the walks started with an immediate ascend. We were in a thick fog and could not see much for 10min. then, alas! The sun evaporated the higher mist and exposed the tops of the hills. As the sun rose, more parts of the hills are observable. The pavilion built in the traditional architecture blended perfectly with the hills and the clouds. The rocks are similar to the karst formations found in Guilin, easily eroded by the receding sea water some 500,000 years ago. Deep caverns and large dents in the cliffs are also found. Watch out for the low ceiling above your head! And for those with an acrophobia (fear of heights), this is apparently not a suitable place. The walk is never dull, as it is filled up with various land forms. A Buddhist temple, first built around 1000yrs ago, is still lively, though with only a few monks. I went in and donate some cash, expressed my wish that the building better be kept at it is and not to be torn down for a new one. Bajiaozhai refers to the very top of a hill on the left of the resting pavilion just before the 15min descending to the car park. It certainly rewards with a panoramic view of the park. One of my travel mates is from Europe. He told me he has travelled quite a lot but never found such land formations. From the look, he was truly stunned. 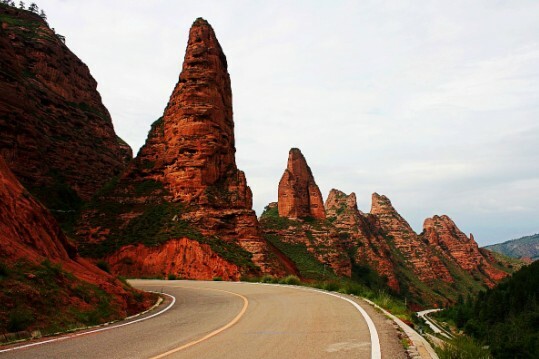 Danxia landforms can also be found in other provinces in China. 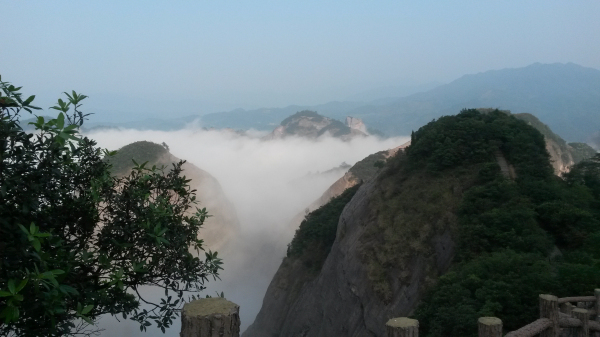 Mount Wuyi of Fujian province, Danxia Mt of Guangdong province, and Kanbula National Park of Qinghai province are all fine examples and interesting travel destinations.